Personal blog of Montreal's still life and product photographer Tristan Robitaille. Tech content, BTSs (behind the scenes), photography tips and general still life photography related content. On November 30th, Phase One surprised everyone with the release of Capture One Pro 9. The new software adds a slew of new controls, some minor, some major. You can upgrade to it from C1P 7 or C1P 8 for $99 USD. The Sony-only version (which is what I am currently using) can be had for $50 USD. Here are the three features that I am the most excited for (in no particular order). Yup, the software now has a live indicator of the tethered camera’s battery charge percentage. I know it’s not the most revolutionary feature but it keeps the frustration of having your camera die on you out the way. It is a menu option that you have to enable. Digital Asset Management (DAM) has been really improved in the new release. Specifically, the way we work with keywords is better than ever before. The refined Keywords tool is similar to what it’s been before. The real star of the show is the Keywords Library tool. You can attribute specific keyword databases to a session or catalog. That makes it a breeze to have your DAM done for a specific shot. You can even import .TXT files with keywords in them, which lets you organize you files even better. It opens up a whole world of inter-connectivity. The Color Editor, a über-powerful tool that I use on virtually all my shots always had the ability to edit a specific colour groupe; you could make adjustments just to the Reds, or the Greens, or the Yellows, and so on. In addition, you can now save that colour mask and use it with other tools, such as the Local Adjustment tool. It will definitely save a ton of time and add another layer of control! Phase One has uploaded quite a few videos on their YouTube channels describing and going over the software’s best new features. I find the new software quite interesting. The $50 USD price for the updated Sony version makes it very appealing indeed! What do you think of it ? Are you a Lightroom person? Share your thoughts in the comments section below! Command+Z, arguably the most beloved keyboard shortcut in the world. It makes working on a computer a so much more enjoyable experience and so much faster too. Have you noticed that in Photoshop, Command+Z only goes back a single step. If you want to go back several steps you have to hit option+command+Z, which is really annoying. By good chance, Photoshop lets you edit all keyboard shortcuts. To do so, go up to the Edit tab, down to Keyboard Shortcuts. There, click on the Edit tab to open the list of associated keyboard shortcuts. Click on the Step Backward row and press on Command+Z on your keyboard. It’s going to warn you about the fact that Command+Z is already in use for another action. You can ignore that. Just click on the Accept button and then on the Ok button in the right hand portion of the screen. Command+Z will not work as it does in any regular software, going back in time endlessly! I think that you should perform that modification as soon as you download Photoshop. What other keyboard shortcuts make your workflow a lot more enjoyable? Share them with us in the comments below! Bundled with the 2.0 version of their firmware, the Post-Focus feature, demonstrated back this summer, lets you accomplish exactly what it’s name says; change your image’s focus point after having taken the photo. While this works similarly to what Lytro is doing, it achieves it by shooting a burst of photo at 30fps and 4K resolution. Then, using the touchscreen on the back of the camera, you can select any focus point, save different versions of the same composition and use focus peaking while being zoomed in to determine to best location for an ultra-precise focus point. This new feature is available on the Lumix DMC-GX8 the DMC-G7 and the DMC-FZ330 and is available since yesterday. The Post Focus firmware update will be available at 01:00 GMT on 25th November, 2015 on the LUMIX Global site (http://panasonic.net/avc/lumix/) for the LUMIX DMC-GX8, DMC-G7 and DMC-FZ330. Now, if this feature gets to evolve a bit, it will be especially useful and will let product photographers like myself focus on the creative aspect of the shot rather than on making sure it’s all in focus. Plus, the results are hopefully going to be smoother because it's entirely computerized and doesn’t introduce the sloppiness of a human. Picture this, you set your shot the way you like it, trigger the camera, let it doing its thing and be left with tens of focus-stacking ready images. The camera could even stitch the files internally, but I’m fairly positive on the fact that I’d like to keep the files and combine them myself on a dedicated software running on a resourceful machine. As it is today, I would not use Panasonic’s new feature. First, I’d have to switch camera system, which I would not enjoy doing at all. Also, the best camera of the three, the DMC-GX8, only has a Micro Four-Third sensor, which will not resolve the best deal of details. Probably the biggest deal breaker for me is the fact that the files are limited in resolution to 4K. I get why Panasonic chose to go with such a resolution and 30fps, I really do, but I can’t help other than wanting to use the full potential of the sensor. I wouldn’t mind having the camera take a minute or even more the record all of the shots, but let me take advantage of all of those megapixels I have. Another point is the fact that you are limited to using continuous lighting since no studio strobe will be able to keep up with the rate of shooting the camera will sustain, hence why it would take more than a minute to complete all of the images. Finally, the output file are JPEGs and, again, that makes me feel like I am missing on the chance to use the full potential and every bit of sharpness that the sensor-lens combo has to offer. The feature will keep improving and, perhaps, camera like the a7R or a7R II will offer a variant of such utility directly targeted at product and still life photographers (and landscape shooters too!). It’s certainly a step in the right direction for Panasonic and the photography industry in general. The only use I would make out of this feature today is shooting e-commerce images where you need to do several tens of them a day and sheer sharpness and details retention isn’t as important since you won’t be blowing them up onto ads or billboards. Anyways, let us know your thoughts and feelings for this new and exciting feature in the comments below! It’s no secret that you absolutely have to make several backups of your work. We’ve heard way too many stories where someone lost years and years of work due to a fire, hard drive malfunction or even having their storage media stolen. Having a good backup isn’t just using a large and reliable hard drive; you have to use a specific folder structure in order to be able to find your stuff down the road. Today, I’ll discuss my particular folder organization for commercial product and still life photography. First off, what I use is fairly industry standard. It is, for the most part, the same hierarchy that Capture One automatically creates when you make and new session. In the session folder, which I name using the date and the name of the project (YYYYMM_PROJECT NAME), there are four subfolders, Capture, Selects, Trash and Output. By the name of it, all of the shots go to the Capture folder, good or not. I personally do not use at all the Selects folder, I prefer to stay in the Output folder. The Trash folder is where files used by Capture One usually go. The master session folder in placed into a folder for that job’s particular client. A copy of the gig’s invoice is also included in the master session folder. Finally, the Output folder is where the action happens. 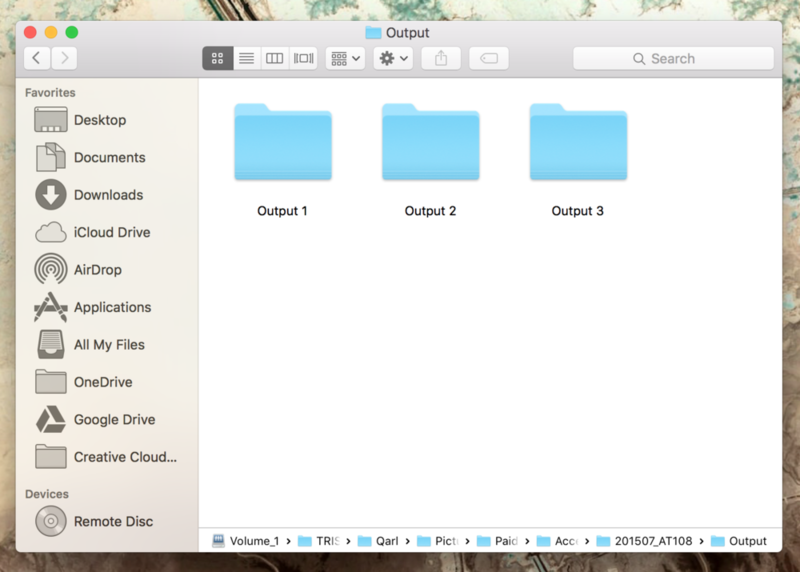 In there, I create (most of the time) 3 sub-folder, named Output 1, Output 2 and Output 3. The first of them is where all of the selected shots will be exported. Those can be ready to be worked on in Photoshop (in which case there are only two subfolders) or will constitute a focus stacked image. All of the focus stacks images reside into the Output 2 folder. Those will then be worked on in Photoshop. There can be a few images per shot (with different exposure, colour temperature or parts that will be masked into one final file). When the image is ready to be delivered to the client, it gets saved to the Output 3 folder. As described by this blog post, I export three (or four, depending on the need of the client) different versions of the same image. There is the master PSD file, the high-quality, single-layered TIFF version, the compressed and ready for web use JPEG file and the transparent background PNG shot (which is as web-ready as the JPEG). All of those get their own sub-folder in the Output 3 folder. For example, in the PSDs folder, there should only be one .psd (or .psb) file per product image for that shoot. This folder structure is not perfect and could most likely be improved upon. However, it works great for me and I can always find the exact file that I'm looking for in a snap. How do you organize your photographic files? Share it with us in the comments below!